Those born in the 70s & 80s will know Singa the Lion very well, during my younger days he was a big icon and almost every school kids are his fans. I remember that I drew many pictures of him, entered into my primary school's courtesy drawing contests; and won some, had erasers, rulers, pencil cases with him printed onto it which I treasured much back then. One of the best memory I have is the campaign song, what I call the Courtesy Song but it's official song title is Make Courtesy Our Way Of Life. I can even remember and sing the lyrics, and believe it or not it is these words that makes me insist that DinoBoy learn and knows all the respectful and good manners. For those who are not familiar with Singa the Lion was the mascot for our country's National Courtesy Campaign that was launched in 1979, a move to encourage us to be kind and considerate with each other. You can read more about Singa and the campaign here and here. Anyway, DinoBoy first saw Singa about 4 years ago when we were walking along a pathway in Dhoby Ghaut Green. Singa was sitting on a marbled chair looking sad, lonely and a little bit dirty, but I was happy to see him there, I eagerly introduced him to DinoBoy. 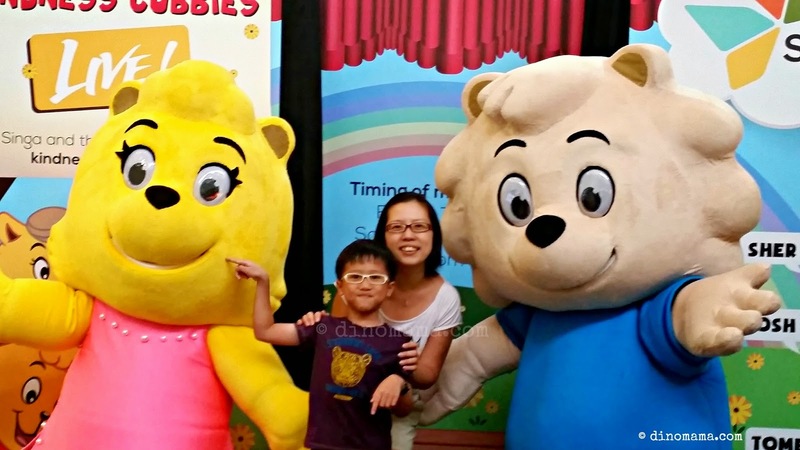 Told him loads of things about "Mama's favourite mascot", his absorbs as much as he could into his little brain but did not want to take a photo with Singa because "he's dirty Mum." *sigh* Needless to say I was heart broken, not because of what DinoBoy said but because for every thing Singa represents, here he is being left alone, vandalized no doubt and without friends. When DinoBoy enters into Primary school I caught glimpse of Singa from the things he brought back, like newsletters, bookmark etc. 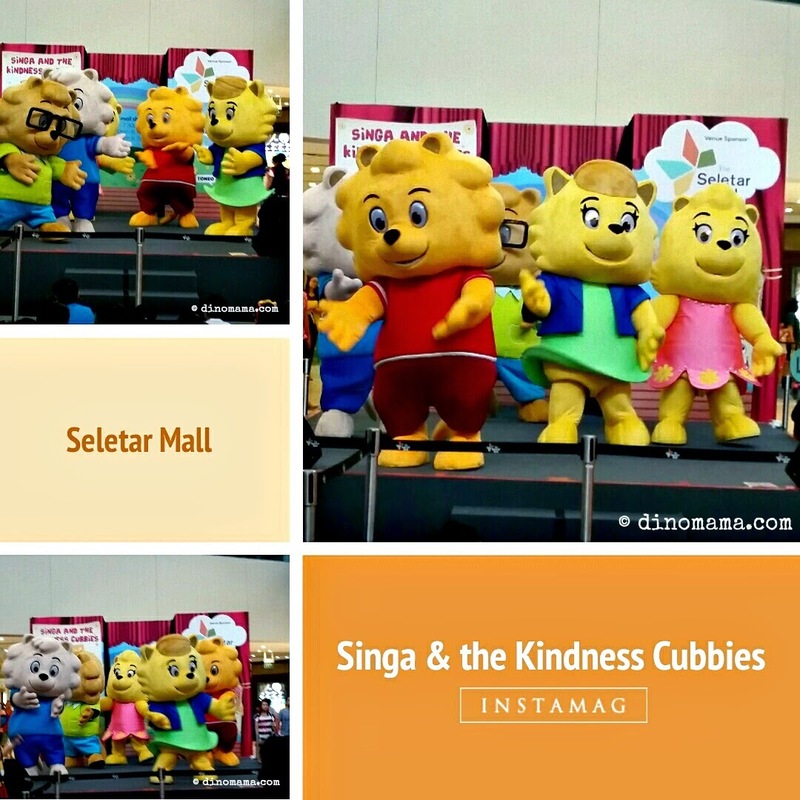 I was pretty excited when I know that Singa is coming to a mall in our neighbourhood and he's bringing 4 cubbies too! I know I just have meet Singa and so off I went with DinoBoy on tow to see my favourite macot. We joined the many other kids and adults in singing and dancing with Singa and the Kindness Cubbies. What happened in Kindsville when the Cubbies think that the 5 magic words are useless and decided to stop using them? Find out the answer by heading down to the next 2 malls (details at the end of the post). Can't get enough of Singa and the Kindness Cubbies? Go to Kindsville to watch Singa and the Kindness Cubbies animation, download the Kindville Times and learn how to make Cubbies clay pin craft. If you haven't catch Singa and the Kindness Cubbies yet, you still have till 3rd May 2015 to do so, here are the show venues, dates and time. Disclaimer : We were invited to watch the Singa and the Kindness Cubbies Live! show and pose with them after the show. We were not compensated in any form or ways and all opinions in this post as 100% our own and based on our experience during the event.